SAN FRANCISCO, CA – May 1, 2013. Joseph & Cohen, a Professional Corporation headquartered in San Francisco, announced today that Kenneth Sayre-Peterson has been elected a partner following his successful stint as Of Counsel with the firm that began in February 2012. Prior to joining Joseph & Cohen, Ken Sayre-Peterson held increasingly senior positions as an attorney with the California Department of Financial Institutions. During his distinguished twenty-two year career, he practiced general financial institutions law and garnered an intimate knowledge of the banking, credit union, money transmitters, securities, and trust laws of California, as well as the pertinent and corresponding federal laws. 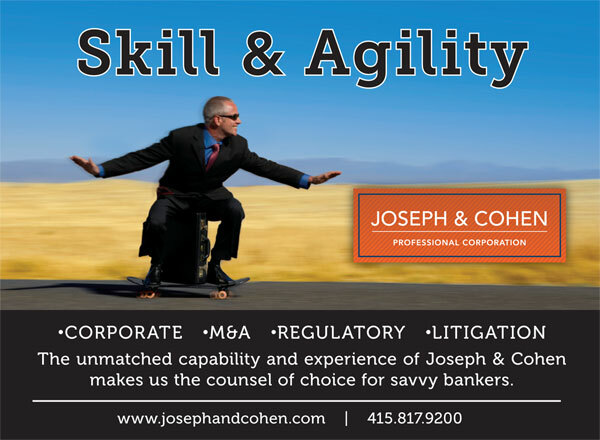 Joseph & Cohen, Professional Corporation, is a Financial Services and Litigation Boutique headquartered in San Francisco that emphasizes complex banking, corporate and transactional matters, regulatory and bank enforcement defense, securities, M & A, bankruptcy and insolvency, employment and commercial and executive employment litigation services. Joseph & Cohen is known for sophisticated expertise, extraordinary commitment to clients, relationship-based services, and a range of specialized skills typically found only in the largest American law firms. For additional information about the Joseph & Cohen, Professional Corporation, please visit our website at www.josephandcohen.com or Facebook at www.facebook.com/josephandcohen.